I have done this with “mini quiches” Just place parchment backing cups in the muffin tin, add fillings and pour in your eggs. If you don’t have parchment cups, double up on the paper. Looking at further comments, I may just go get some silicone cups. Going to try freezing muffin batter today. This idea is rocking my world, too! I love muffins, but we never go through a whole batch before they go bad and freezing after baking usually leaves them too dry for my taste so this will be perfect. 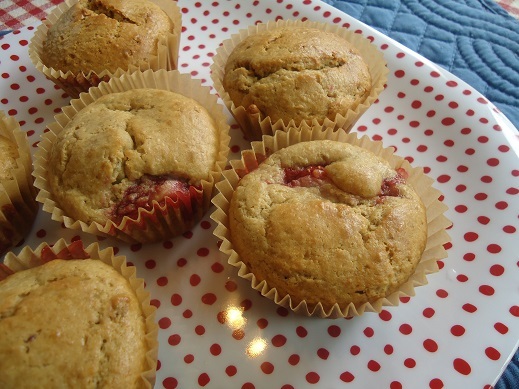 And I cannot wait for the strawberries and cream muffin recipe, it looks so delicious. I like this too as I can prep muffins on a day when it is too hot to bake. Thanks for the great tip! This is great. School will be starting soon. Our daughter-in-law is a sub for our local school district so I am never sure when I will be watching the grandchildren. Now I can have the grandson’s favorite muffins ready for him at a moments notice. Thank you so much for sharing. We love muffins in our house as well and this sounds like an amazing idea – which I’ve certainly not thought of! I’ve frozen baked muffins and they are okay when reheated, but this method will deliver the freshest tasting muffin! I look forward to your other muffin tips. Thanks! Glad you enjoyed the idea!! 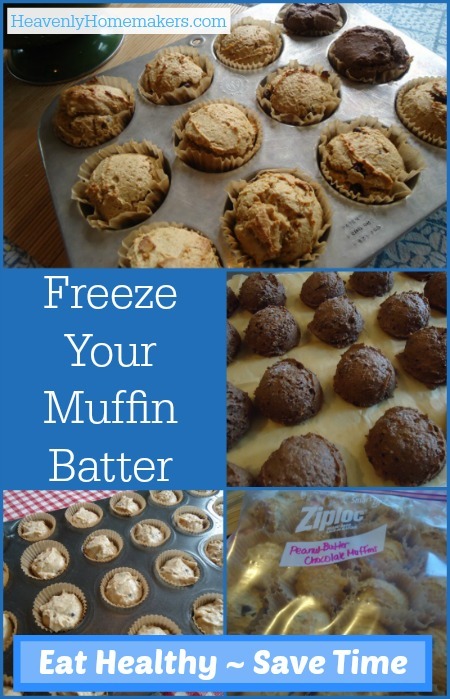 My freezer is never without muffin batter in several varieties!! So glad I finally had a chance to try your idea. Thank you again for sending it to me! Why didn’t I think of this! . I do this all the time with cookie dough! No, I did not know this!!! I can’t wait to try it! I really like doing this with cookie dough too. Then popping out the frozen balls for quick and warm and fresh cookies! Yum! Thank you for your tips! I have been doing this for quite some time now. I used to make scones and freeze them before baking them and mentioned to my mom how easy it was. She asked if I had thought of doing that with muffins since they are less labor intensive without the same forming process as scones. I tried it and now my life is changed! I have also learned to put as many as I can in silicone muffins cups and then pop them out after they are frozen (so that I can use the silicone to form more muffins.) That way the muffin papers don’t get crushed while being stored in the freezer since when I want to make the muffins I put them into paper at that point. Are you using Hard White Wheat or Soft White Wheat for your muffins? Do you sift the soft white wheat? I haven’t had much luck trying to bake with it. This is awesome! I did not know this information… I too have muffins in my freezer, already baked! =) I have a friend who has a coffee shop and she sells homemade muffins too, I just had to share this tip with her too. Thanks! I think what I like best about this is the idea of being able to have a variety at once without having a gazillion muffins! Brilliant! Never have heard of this. Wonderful idea. I do cookie dough like this but never muffins. I have frozen the batter poured into ziplock bags then defrosted in the refrigerator the night before. You have to scoop it into muffin tins before cooking, but it lays flat in the freezer and you can stack them up. Since I only have two boys I usually freeze the bags with half the batter so I only make what we need at one time. Someone said on another site this was posted on- she defrosts and cuts the tip off the ziploc and pipes the batter into the cups. Thought that was a great idea! Brilliant tip to share! Thanks. This is the most exciting cooking lesson I have learned since I found out about wheat grinders! Whoo-hoo! What a great idea! I will be trying this to help expedite breakfasts! Thank you for sharing. I’m really excited to try this. I love fresh muffins!! So much better than day old or frozen muffins…thanks!! Love this! I love having them in the freezer but also like them fresh baked much more than from the freezer! Problem solved. Thanks for sharing this info. I’ll have to try it soon. I have never heard of freezing the muffins raw like this. Seriously, you are my new best friend. And so is Vicky. So excited about this idea!! I haven’t tried it, but hope to soon with my Coconut Flour Muffin recipes. Nope, never heard of, or tried it, but I sure will NOW! Thank you so much for this! I’ve been picking blueberries from our garden this week and freezing them. Now I know I should set some aside to make into a muffin batch or more. Yay! I had absolutely no idea. I am fighting the urge to join ur frenzy. Lol. I am SO doing this! 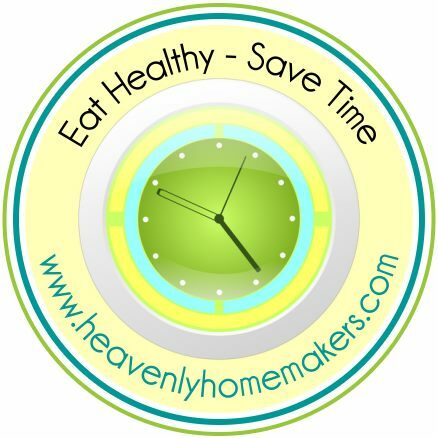 I have a list of get-ready-for-back-to-school meals I need to make and have several quick breads and muffins on that list for breakfasts and snacks…my children will love this. I can pull out each of their favorite muffins and bake them all at once! Do you freezer them in the paper cups? Also, what adjustments are needed during baking since they are frozen (temperature and how long do you bake them)? Thanks for the great idea! Will be making mine this week with school starting soon. Yes, I freeze them in the paper cups to make baking (and cleaning) easier later. I bake them as directed, just adding a few extra minutes to the baking time if needed. What a fantastic idea! I’ve been so disgusted with the nasty breakfast cereal options lately, that I stopped buying it. We have been eating muffins and toast and sometimes oatmeal. My kids hate waiting for me to mix nd bake muffins though. This would be a time saver. I love the thought that my kids are getting whole grains for breakfast instead of processed junk cereal. I use my Nutrimill to grind my grains too. Spelt is a favorite for muffins! 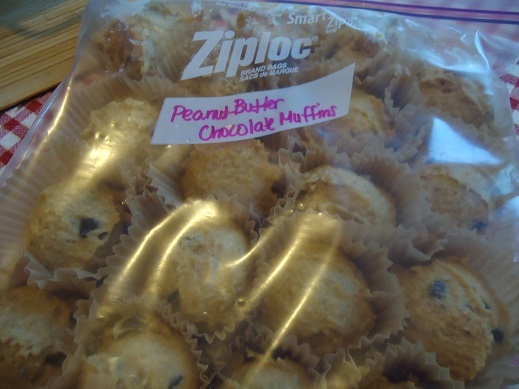 I have been freezing muffins for a few months now, however all I do is make my batter then put it into a zip lock bag, lay it flat on a baking sheet and freeze it. It is MUCH easier to store it that way. I have a small amount if frezzer space, so I stack my flat muffin zip lock bags on top one another. To bake them I set out till soft(put in fridge the night before) and I will either cut the tip of the bag and pipe them into the pan OR use a mini cookie scoop and scoop them out of the bag and put into the tin. Love having a freezer full of muffins! I think this just changed my life! Wow, that’s great! My husband really likes FRESH breads. (Instead of baked, frozen,reheated, and thus dry, muffins. Of course, who doesn’t?) But as a mom of 3 children 3 and under, I can certainly use ways to save time. Oh, wow, I’m SO excited about trying this! I could even just make a full batch of muffins (12), and bake 6 and freeze 6 for fresh muffins again later! So awesome!I will DEFINITELY try this!!! Thank you!!!! Wow, this sounds so cool. 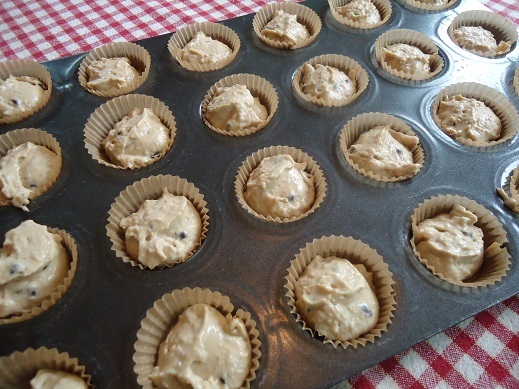 I freeze scoops of unbaked cookie dough but freezing muffin dough never occurred to me. OK, now that I have my new, larger side by side fridge, I will have to get a freezer! Great idea. I have found that a small 6 muffin pan fits just right into my toaster oven (a la Jiffy Corn Muffins). Only turning the small toaster oven on is a lot better than the big oven, on these hot days. Also, for just the two of us, we do not need a full size batch! Seriously! I never thought of this. But I too enjoy making muffins and often do that at Christmas time instead of the usual cookies that everyone seems to have. I will have to try this! I make muffins all of the time and this idea is wonderful! I always make extra batches of muffins to freeze, but it would be so nice to smell them baking in the morning without all of the prep work. Thanks so much for the idea, I can’t wait to try it! My kids love fresh baked muffins! I work full time, so this is going to be great for busy school mornings! Can’t wait to try! Wow, that’s a great idea that I never thought of! I make muffins all the time and usually freeze some after baking, but doing it before could save time and space in the freezer. Has anyone tries to freeze pancake batter? I have, and don’t love it. I prefer to cook extra pancakes, then freeze them to rewarm quickly in a toaster oven. BRILLIANT!!! Thank you so much for sharing that idea! Such a great idea! Ibknowbthis has nothing to do with breakfast- but would it work with cupcakes too? I’ve never tried it, but I would think so! It works on everything. Also cake batters, pies (I make mini fried pies and freeze before cooking). Sometimes I think my freezers are my best friends!!!!!!!!!!! Have you tried with with gf muffins? I’m getting a gf book from the library soon and would love to be able to stock my freezer with gf make aheads! No, I don’t have a lot of experience with GF muffins, so I’m not sure. This should work fine with Gluten free muffins! Each batter still generally uses a flour, fat/oil, sugar and rising agent like baking soda or powder. I am going to try this with some coconut flour ones next! I have been freezing muffin batter for about 10 years. Your method is great for Individual servings and I will have to try it. I started freezing muffin batter when I tried frozen muffin batter from a Canadian company called MacMillans. For their batters, you simply use an ice cream scoop to take out as many batter balls as needed, and bake from frozen. I do the same with my own muffin batter. As .ong as you work from frozen batter, this works well. I like putting several dozen muffins worth in the freezer at a time. Then on busy mornings, we scoop and bake. This is how I do cookies! Make the dough (usually 4x batch) then get one of your kids to roll the dough into a million cookie-sized balls and place on a cookie sheet-real close together, even touching. Freeze. 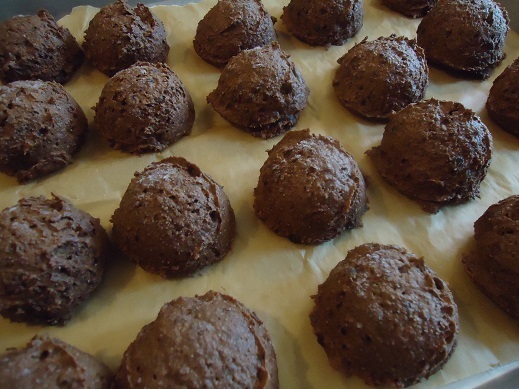 Put frozen cookie dough balls in zip lock and store in freezer. Later when you need 4 cookies or 3 dozen cookies, take out what you need and bake ’em up! You’re always only 12 minutes away from freshly baked cookies that didn’t come from a factory! Hi Laura – thanks for passing on this great idea. I’m sure I’d NEVER have thought of it on my own! One question . . . does this work with your coconut flour muffin recipe? Was wondering if it would work the same since there’s so little flour used and it seems to me the batter would freeze up much harder. Thanks! Coconut flour can be so finicky. Since Laura hasn’t tried it, it is hard to know for sure but she is doubtful that it would work out as well. hi how long can the frozen mix keep in the freezer ? cos i found that the muffins dont rise when the batter is frozen . I keep mine up to three months. Fantastic tips! Just one question, I find whenever I freeze things, especially muffins they always get freezer burn! Any tips? My biggest tips to avoid freezer burn are to make sure the item has completely cooled before packaging, make sure the packaging is air tight, and to use the freezer item within 1-2 months. Thanks for the blueberry muffins reference, I had some frozen blueberries waiting for their next destination! They’re now stirred into a batch that is finishing off its last couple of minutes as ten mini muffins in the oven, and another ten mini muffins are chilling in the freezer. Love mini muffins as they are the perfect size for little people. Hi Laura, I love the idea of freezing muffin batter especially since schools about to start!! I work at the school as well so I need/want something easy for breakfast. Do you happen to have a list of just your muffin recipes? Or a book ore book of just muffins or breakfast? Thanks for your great recipes!! Oh mah gawd my life is changed forever. Freeze all the things!! Oh my goodness, you are my hero! My boys always want muffins and I always do not feel like mixing up muffins at 6:30 in the morning! This Sunday after Passover is finished (and we can have wheat again) we are making LOTS of muffins!!! Thank you for this awesome tip! Will freezing a muffin recipe affect the density and moisture when baking. I’m concerned about achieving muffin peaks. Hi! Brilliant idea! Like the comment above, i was wondering how this affects the leavening agents in the batter? I know you are never supposed to make pancake batter ahead of time because it affects the leavening, so i am curious about this…. I have 5 kiddos and this would make such a difference if it works out for me. Curious, I wonder if you put them directly in the oven from the freezer vs. letting them thaw in fridge overnight if it would make a difference in the density, fluffy, moisture, etc.? Might be an experiment in my near future….unless someone on here has tried it already? Thanks so much for the clever idea!